This work utilizes text, which I had been playing with since 1996. The text is a stream of consciousness type list of things that “I really should” do such as “pay back my student loan”, “drink more water”, “take more chances”, “clean out the litter box” etc… Originally this took the form of a video monologue, and then later in 1999 it came to the surface again in my work as hand written black magic marker notes on refrigerators (view). In 2002 I reincarnated this list, which I increased to 1000 things “I really should” do, as an audio CD multiple. This latest version can be exhibited in various ways such as a minimalist wall mounted stainless steel sound box, with or without headphones; or simply playing through speakers directly in the gallery. The audio track is a monotone voice (myself) listing off all 1000 things I really should do. This work is clearly humorous and lighthearted in nature. I first began this inane list in order to poke fun at myself and to comment on my increasingly obsessive tendencies. However, this work is not limited to being simply autobiographical in nature. The tendency towards procrastination, whether it involves doing those things we have always wanted to, improving self-perceived character flaws or the mind numbingly repetitive tasks of everyday life, surely this proclivity is universal whatever the personal circumstance. 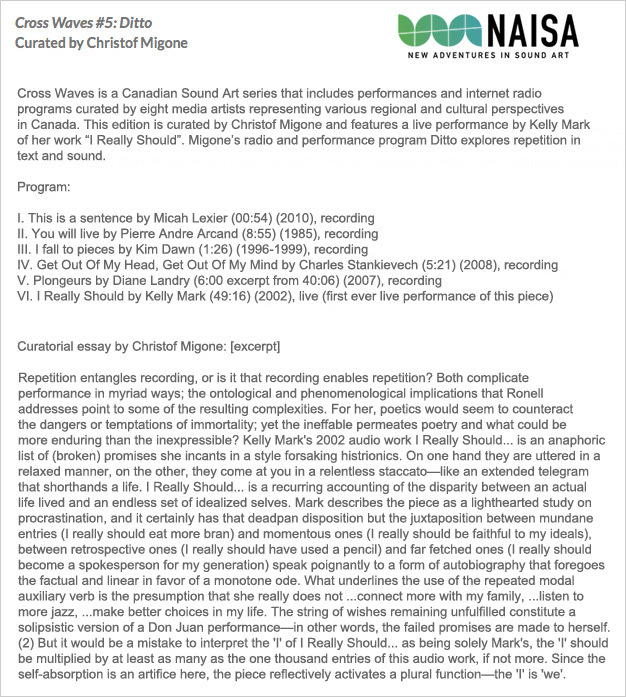 Live Performance:2015 NAISA (Toronto) as part of Crosswaves #5. Curated by Christof Mignon.